The Defence of the Seven Sacraments also known as Assertio Septem Sacramentorum was a theological treatise written in 1521 and was officially attributed to King Henry VIII. Henry began writing it in 1519 whilst he was reading Martin Luther’s attack on indulgences and denounced the Papal system. By June 1519 Henry had shown his work to Cardinal Wolsey, Wolsey would be the only to read it for the next three years. 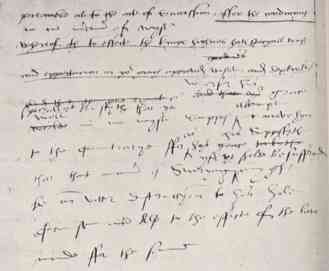 The original manuscript would become the first two chapters of Assertio Septem Sacramentorum with the rest of the treatise being made up of new material that related to Luther’s De Captivitate Babylonica, many believe that Sir Thomas More was involved in the working of this piece. Henry dedicated the treatise to Pope Leo X who received a copy on 2nd October 1521 who upon reading it rewarded Henry with the title of Fidei Defensor – Defender of the Faith on 11th October. 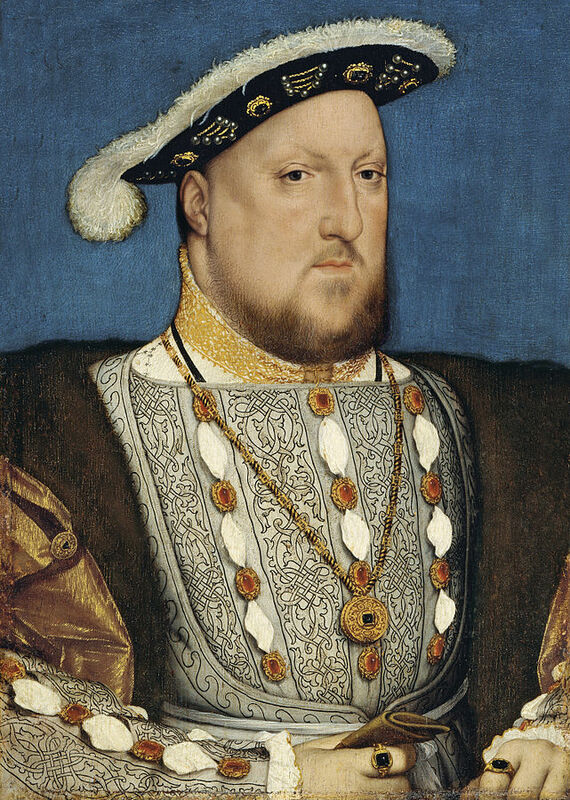 Although the title was officially revoked following Henry’s break with Rome and the Catholic Church. 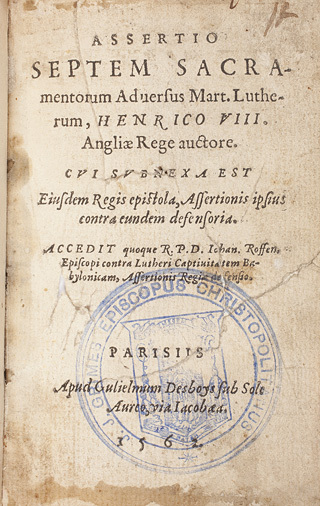 There has been some debate whether Henry did indeed write the book himself or whether it was written by someone such as Cardinal Wolsey, Sir Thomas More or Bishop Fisher and it was published under the King’s name in order to give it more substance. 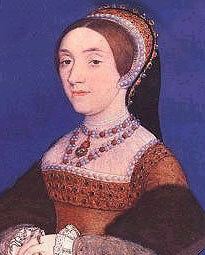 In 1541 King Henry VIII set of on royal progress to the north of England with his fifth wife, Catherine Howard. On 16th September 1541 Henry and his travelling court entered the city of York through Walmgate Bar where they were met by the mayor and aldermen of the city who would beg forgiveness from the King for the Pilgrimage of Grace, when the north rebelled against the King in 1536. The King and his wife were then presented with a gold cup that were both filled with gold coins as a token of welcome. 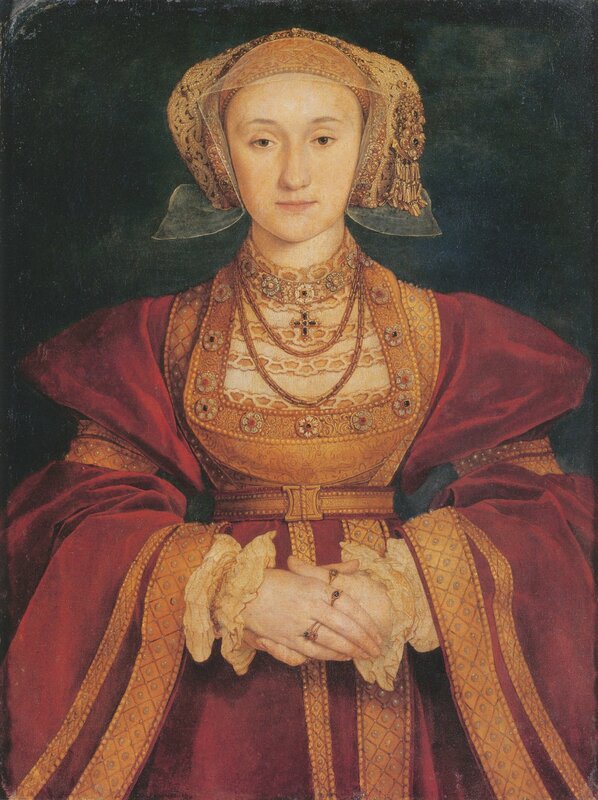 The royal progress was normally a grand affair and this one was no different Henry had not long been married to his young bride and wanted to show to the country that the disastrous marriage to Anne of Cleves was not his fault. The progress made many stops on their way to York after leaving London on 30th June. They arrived in Lincoln on 9th August and visiting Pontefract on 23rd August before arriving in York on 16th September via Cawood, Wressle, Leconfield and Hull. Henry had also arranged to meet King James V of Scotland at York to discuss the prospect of peace between the two countries. However, King James did not show to the meeting. 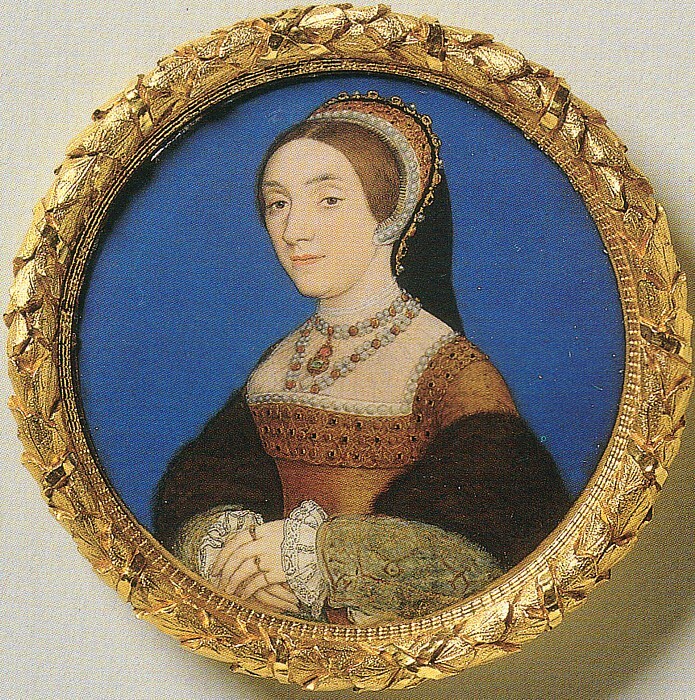 It was also on this royal progress that Catherine Howard had become involved with Thomas Culpepper, an affair that was discovered shortly after their return to London and seal the young Queen’s fate. 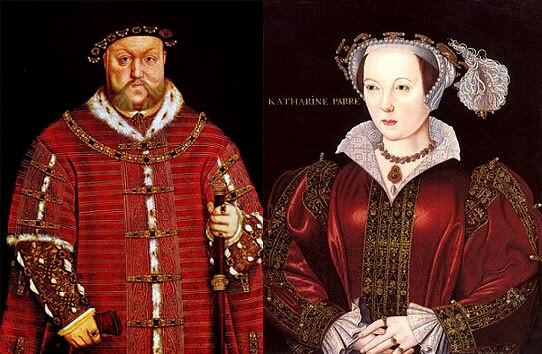 On 12th July 1543 King Henry VIII married his sixth and final wife, Katherine Parr at Hampton Court Palace. The ceremony was a private matter that took place in the Queen’s Closet within the Chapel Royal. As a private ceremony approximately 20 people attended this included the King’s daughters, Mary and Elizabeth, Margaret Douglas, Henry niece, the Duke and Duchess of Suffolk, Viscountess Lisle, Countess of Hertford as well as Katherine’s sister and her husband, Anne and William Herbert. The ceremony was presided over by Bishop Stephen Gardiner and following the ceremony was a lavish breakfast where Katherine was proclaimed Queen, the first of Henry’s wives to be proclaimed Queen on her wedding day unlike Katherine of Aragon and Anne Boleyn who had coronations to proclaim their right to be called Queen. “Notarial instrument witnessing that, on 12 July 1543, 35 Hen. VIII., in an upper oratory called “the Quynes Pruevey closet” within the honour of Hampton Court, Westm. dioc., in presence of the noble and gentle persons named at the foot of this instrument and of me, Ric. Watkins, the King’s prothonotary, the King and lady Katharine Latymer alias Parr being met there for the purpose of solemnising matrimony between them, Stephen bp. Of Winchester proclaimed in English that they were met to join in marriage the said King and Lady Katharine, and if anyone knew any impediment thereto he should declare it. The licence for the marriage without publication of banns, sealed by Thos. abp. Of Canterbury and dated 10 July 1543, being then brought in, and none opposing but all applauding the marriage, the said bp. of Winchester put the questions to which the King, hilari vult, replied “Yea” and the lady Katharine also replied that it was her wish; and then the King taking her right hand, repeated after the Bishop the words, “I, Henry, take thee, Katharine to my wedded wife, to have and to hold from this day forward, for better for worse, for richer for poorer, in sickness and in health, till death us depart, and thereto I plight thee my troth.” Then, releasing and again clasping hands, the lady Katharine likewise said “I, Katharine, take thee Henry to my wedded husband, to have and to hold from this day forward, for better for worse, for richer for poorer, in sickness and in health, to be bonayr and buxome in bed and at board, till death us depart, and thereto I plight unto thee my troth.” The putting on of the wedding ring and proffer of gold and silver followed; and the Bishop, after prayer, pronounced a benediction. The King then commanded the prothonotary to make a public instrument of the premises. The week after their wedding the newly married couple set off on their first summer Progress and husband and wife. Henry’s mother, Elizabeth of York, would have gone into confinement after hearing a mass at the beginning of June. Her confinement would have been arranged down to the finest detail. Elizabeth’s chamber would have been highly decorated with intricate tapestries hanging from the walls, bed and windows they would be rich in colour and heavy. There would have also been hangings and cloth across the chamber. It would have been Elizabeth’s first confinement to take place in the height of summer and with the room plunged into darkness it would have been hotter than usual. On 28th June Elizabeth gave birth to her second son. Henry would have been taken by his nurses and bathed in various substances including milk, sweet butter and barley water amongst others in the hope of preventing death before the infant was baptised. Henry’s birth was less significant compared to his elder brother and sister. Very few records exist of Henry’s birth and even his paternal grandmother, Margaret Beaufort, only wrote a small note in her Book of Hours when she had wrote dates and times for Arthur. Henry was destining for a quiet life as the spare. Henry was baptised in Greenwich Church of the Observant Friars where Richard Foxe, Bishop of Exeter presided over the service. The church was lavishly decorated with tapestries, damask and cloth of gold and a wooden stage was built where the Canterbury silver font was placed. 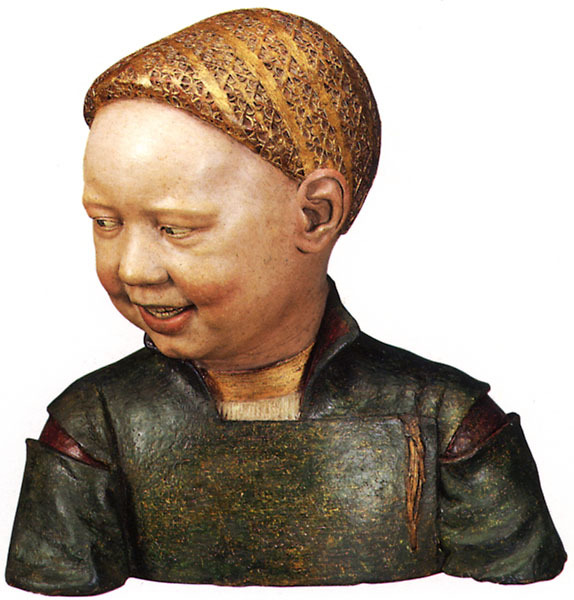 Now baptised Henry would soon be sent to Eltham where he would join his sister in the royal nursery. Just 11 years later Henry would suddenly find himself the new heir to the throne after the unexpected death of his older brother and with that Henry was catapulted into a life that would lead him to be King.